Cooked shrimp appetizers make any occasion fancier. If tuna is the chicken of the sea, then surely shrimp is the marine equivalent of a fancy sausage. Like the latter, shrimp is a versatile food that is especially useful as appetizers. If your kids are shrimp fans, start your evening off in style by making easy and delicious cooked shrimp appetizers that your family will go nuts for. 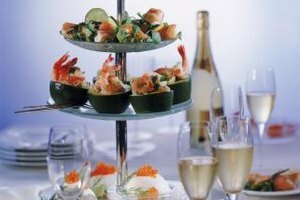 With a few simple and creative ideas, you can turn your family's before-dinner experience into an elegant affair. You've seen shrimp rings, but you can make other easy dips and spreads that your kids will enjoy with cooked shrimp. Make a yummy shrimp spread by spreading cream cheese on whole wheat crackers. Top with cooked shrimp, green onions and olives. Make a delicious shrimp salsa with chopped shrimp, avocado, tomatoes, onions, cucumber, cilantro and lime juice. Salt to taste and serve with corn chips. Make a Cajun shrimp spread by mixing cream cheese, sour cream, garlic, chopped shrimp, spinach, red pepper and onion. Mix it all together and serve to your family with crackers. Or dip your cooked shrimp in the traditional cocktail sauce. If your kids aren't partial to spicy foods, provide ketchup or creamy salad dressing. Shrimp, as a topper on bread, makes an easy appetizer. Make shrimp bruschetta by combining diced tomatoes, onions, balsamic vinegar and oil. Spread the mixture on a sliced baguette and put a cooked shrimp on top. To make the bruschetta sweeter, replace the tomatoes with raisins. Prepare a shrimp and cheese appetizer that your family will gobble up. Mix cheddar cheese with some butter and an egg yolk. Place one shrimp each on pieces of bread, top with the cheese mixture and bake until crispy. Shrimp skewers or kabobs make a great party appetizer, even for kids because they can eat them without getting their hands too messy. Make simple breaded shrimp kabobs by coating shrimp in oil and garlic then dipping them into breadcrumbs. Place the breaded shrimp on skewers, grill and serve. Try placing cooked shrimp on skewers with vegetables, such as peppers, onions, mushrooms or tomatoes. Grill the skewers in the oven or on the barbecue and coat with barbecue sauce. Or leave off the barbecue sauce and provide a selection of dips that appeals to your entire family. Go with the spicier dips for the adults -- try salsa or a creamy chipotle dressing. For the younger crowd, serve with ketchup or ranch dressing. Shrimp and bacon taste delicious together and are perfect, kid-friendly appetizers. Coat some shrimp in your favorite creamy salad dressing, wrap cooked bacon around it and secure it in place with a toothpick. Broil it for a few minutes and serve. 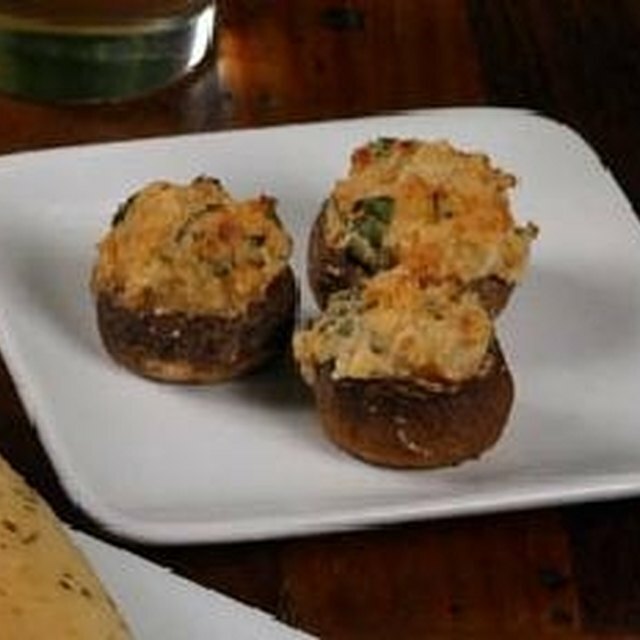 You can enhance this appetizer by adding your kids' favorite vegetables into the mix. Place a mushroom in between the shrimp and bacon. A slice of red pepper or onion also works well.